Perfect for new beginnings and the metaphorical birth of ideas, oval shape tanzanite is winning the race for most loved gemstone shapes in latest fashion trends. Be it studs, rings or tanzanite pendants, oval stones are the perfect combination of traditional yet unique. 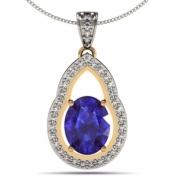 An oval shaped tanzanite pendant is flexible in every aspect. Oval is known to be a shape that is inherently adaptable to any need and use, and it happens to enhance both round and sharp features equally well by its gentle curve as well as elongated ratio. Tanzanite is every fashion jewelers dream come true. Not only is it easy to work it, it also happens to complement and accent every other stone in the gemstone spectrum – especially clear cut diamonds – and works astonishingly well with both casual and formal outfits. A pendant too can be molded to suit both formal and casual wear. Want to add a splash of glamour to your office wear? 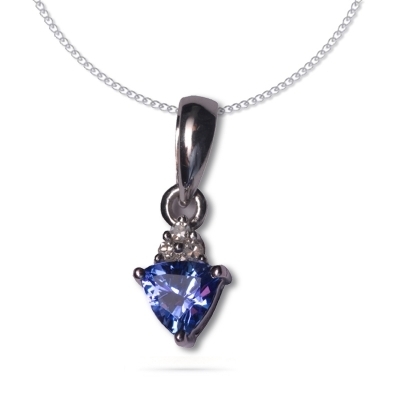 Buy yourself a small oval tanzanite pendant – not more than 5 or 7 carats – set in white metal. String it on a delicate chain and it will add the right amount of sparkle for even a formal day at work! The key to matching a pendant to our outfit is size, color and cut. While color is taken care of with the tanzanite’s vibrant and imperial blue, the oval shape tanzanite solves the cut issue as well. So now all you need to worry about is the size of the pendant. Formal wear? It should be small and subtle, plus you can match it with the perfect ring! Now for the casual pendant styles. For a day out, your summer dresses or a boat-neck sweater and jeans can be upped with a pendant too! You can go for slightly larger stones and maybe even add a second stone to accent it. If you’re the kind who likes that extra bling then a little metal work isn’t a bad idea. Charm pendants also fall under the casual neck-wear jewel category. Adding a little extra life or meaning to your pendants is easy – just chose a shaped charm pendant. You could even have a combination of both. A tanzanite pendant and a small engraved metal plaque can be strung together on a chain for a unique yet gorgeous appearance. Now come the big guns. Cocktail parties and formal evening wear. Now this is your chance to shine ladies; fashion with pendants has never been more important. Statement pendants are a great replacement for chandelier earrings. Often necklines of gowns or dresses don’t call for earrings but instead require the right amount of neckwear. How do you cross that bridge? Hunt for the ideal oval shape tanzanite, set in metal with a little work and diamond or zircon encrusting to up the gleam. If the occasion calls for it, you could even go for a vintage setting and add to that royal blue a little art deco metal work. Size is important, so go all out! Fashion with pendants isn’t hard, but often it is easier to design your own to suit your needs. If you don’t find the perfect pendant online then just pick the stone and create your own style!